As we head into the very last stretch of regular season, the NHL is packed full of action. With teams jockeying for playoff positions and trying to secure home ice advantage for the first round, tonight’s schedule will be more must-see television. The St. Louis Blues and Vegas Golden Knights will do battle to try and show who is a real contender in the Western Conference. As they and the rest of the 11 teams in action tonight prepare, we’ll be here keeping track of all the minor moves. The Washington Capitals have sent Tyler Lewington back down, a cap saving measure for the team as they grind towards the playoffs. With Lewington sent down, the team now has enough cap room to recall Jonas Siegenthaler, their preferred replacement on defense. Without Michal Kempny available the team was in a financial pinch, and could be in trouble if any other players get injured. The Nashville Predators have assigned Miikka Salomaki and Austin Watson to the minor leagues on long-term injury loans. Watson of course was recently reinstated from his indefinite suspension and hasn’t played in an NHL game since late January. Salomaki too will need time to get back up to speed after sitting out for months due to injury. Joey Anderson is on his way back to the NHL, recalled today by the New Jersey Devils. The 20-year old has played 29 games for the Devils this year, but dealt with injury and missed a good chunk of development time. Selected in the third round, Anderson developed into a legitimate two-way threat in college and looks to have a long future in New Jersey. The Nashville Predators are saddened and disappointed for Austin Watson and his family as he enters the NHL/NHLPA Substance Abuse and Behavioral Health Program for alcohol-related treatment. We are grateful for the NHL and NHLPA’s program and will cooperate in any way necessary as we continue to support Austin and his family as they go through this difficult time. Because of the personal nature of the Substance Abuse and Behavioral Health Program and our exclusive focus on Austin and his family’s well-being, there will be no further comment on this matter. Watson already served an 18-game suspension earlier this season for a domestic violence arrest in the summer, one that was reduced from an original sentence of 27 games by a neutral arbitrator. It’s not apparent what has happened to force this second suspension, but the Predators are instantly without one of their most versatile forwards for the time being and perhaps the rest of the season. After returning to the lineup on November 15th, Watson had collected seven goals and 13 points in 34 games while playing the most minutes of his short career. The big, physical forward had already collected 99 hits in those 34 games, which actually leads the Predators entire roster despite the missed time from suspension. For a team that is loading up for another long playoff run, losing a player of his nature is a tough blow. It’s hard to know exactly what the outcome will be in this siutation. Joe Rexrode of the Tennessean believes that this is the end of Watson’s career in Nashville, and tells readers to simply root for the 27-year old’s survival at this point. 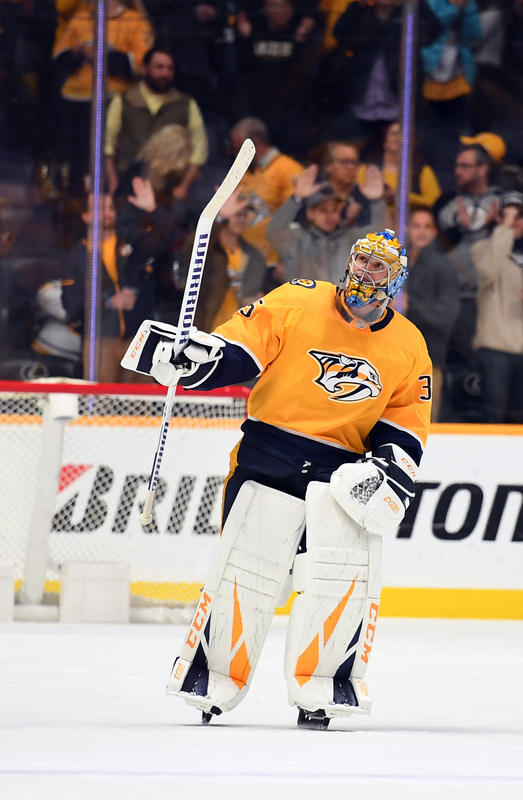 Watson has one year remaining on his contract after this season, but there is no guarantee he ever suits up again for the Predators. For now, the team will support him and his family as they try to battle through the alcohol issues. Our organization was not involved in the appeal of Austin Watson’s 27-game suspension, but we are aware of its reduction to 18 games. As previously stated, our focus has and will continue to be the health and well-being of Austin and his family. We have reviewed Arbitrator Shyam Das’ opinion in the NHLPA’s appeal of Austin Watson’s suspension for domestic assault which reduced the League-imposed suspension of 27 games to 18 games. We are disappointed with the Arbitrator’s decision. We firmly believe that the right of appeal to an arbitrator of League discipline was never intended to substitute the arbitrator’s judgment for that of the Commissioner, particularly on matters of important League policy and the articulation of acceptable standards of conduct for individuals involved in the National Hockey League. The NHL remains committed to continuing to do what we believe is right. And, in this regard, we intend to continue our steadfast efforts to ensure everyone in our League is adequately educated and sensitized to the importance of this serious social issue. We will not hesitate to adhere to and enforce–through firm discipline as necessary–the standards of personal conduct we feel are appropriate for our League. Though very different situations, this reduction may play into a potential neutral arbitration for suspended Washington Capitals forward Tom Wilson. Wilson will first have Gary Bettman hear his appeal, but can then move to a neutral arbitrator to try and have it reduced. The Watson reduction does by no means mean a reduction for Wislon is guaranteed, but it could be used during the process. The Vancouver Canucks will not have free agent addition Antoine Roussel in the lineup when the regular season begins. Roussel has been sidelined since the start of training camp due to a concussion, but the hope was that without preseason action, he would have the time and rest to be ready for the real thing. However, in speaking to head coach Travis Green, Ben Kuzma of the Province has confirmed that Roussel will not be ready for the start of the season. Green gave no timeline for his return, only stating that a comeback in time for opening night had been ruled out. Green did add that young goaltender Thatcher Demko has also been dealing with concussion symptoms. He has entered the league’s concussion protocol and there is no word on when he will be ready to play or whether he will begin the season on the injured reserve or in the AHL. Kuzma writes that Demko collided with the Calgary Flames’ Mikael Backlund during last Saturday’s preseason match, but his condition deteriorated to the point of being diagnosed ahead of the Canucks’ next game on Monday night. Considering bottom-six forward Roussel and current third-string goalie Demko have been the only training camp casualties in Vancouver, the team has had relatively good luck. They hope it stays that was as the team needs a healthy and positive start to the season given their struggles over the past few years. Another player missing to star the 2018-19 season in Nashville Predators forward Austin Watson. Watson was suspended for the first 27 games of the campaign for his role in a domestic abuse incident this off-season. Watson pled no contest to the assault charges an the NHL felt that a third of the season was fitting supplemental punishment. However, Watson did appeal his suspension and that hearing with a neutral arbitrator took place yesterday, according to TSN’s Pierre LeBrun. LeBrun suggests that, unlike in salary arbitration, this decision could take up to a couple weeks. If Watson is successful in his appeal, an unlikely outcome, the arbitrator will choose a new, shortened length that he sees fit. If not, Watson will be eligible to return to the Predators on December 3rd. Quinn Olson, the younger brother of Anaheim Ducks prospect Kyle Olson, has made a decision on where he wants to start his next season. The younger Olson will pass up the major junior route that his brother, a forward for the WHL’s Tri-City Americans, took and will instead opt to go the college route. Olson has committed to the University of Minnesota-Duluth, the NCAA’s reigning champion, reports College Hockey Inc. The undersized but effective 17-year-old forward is playing this season for the Okotoks Oilers of the junior-A Alberta Junior Hockey League and could possibly play one more season with the team, but if he continues to score at a point-per-game pace, as he has for much of the last season plus, the Bulldogs will probably try to bring him in next year instead. Olson is a draft-eligible prospect for the upcoming 2019 NHL Draft and is likely to join his brother in an NHL pipeline shortly. Last week, the NHL indicated they would be making a final decision on supplementary discipline for Predators winger Austin Watson, who pled no contest to a domestic assault incident earlier this summer. That decision has been made and they announced that Watson has been suspended for the first 27 games of the season as well as the entire preseason. Sportsnet’s Chris Johnston reports (Twitter link) that the NHLPA intends to appeal the suspension. Today’s ruling, while tailored to the specific facts of this case and the individuals involved, is necessary and consistent with the NHL’s strongly held view that it cannot and will not tolerate this and similar types of conduct. Watson’s plea came back in late July and at the time, he was given three months of probation and was placed on judicial diversion. This means that if he complies with all of the terms set, his case will be expunged. Watson will not be paid for the duration of the suspension and will be eligible to return to Nashville’s lineup on December 3rd.